Aldi and Lidl continue to attract customers – what impact will Jack’s have? September 26, 2018, 10:11 a.m. Recently, Tesco unveiled its first ‘Jack’s’ discount store. With a strong emphasis on ‘Britishness’ and home-grown products, the brand is seen as a challenger to the German supermarkets, Aldi and Lidl. 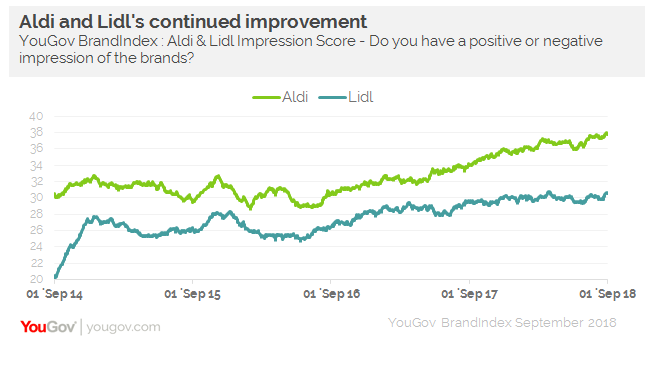 I have often talked in this column about the growth of both Aldi and Lidl, and YouGov BrandIndex data points to the continued improvements both brands have achieved in terms of consumer perception. Among the general public, Aldi’s Impression score (do you have a positive or negative impression of a brand?) has grown from +30 to +38 since September 2014. The retailer’s Purchase Consideration score has also improved alongside this, rising from +31 to +41 over the same time period. It is a similar story with Lidl. Its Impression score has also improved, in this case from +22 to +30, while its Purchase Consideration rating has jumped from +26 +31. Tesco has itself shown impressive improvement over the last couple of years, thanks in part to measures introduced by CEO Dave Lewis. 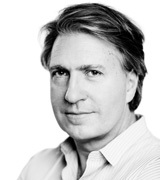 The brand has made great strides in terms of consumer perception. Tesco’s Impression score has moved from a low of -7 in December 2014, to a rating +28 at the current time. Its Value for Money score has also recovered impressively, gradually improving from +3 to +18 over the same period. This has been reflected in its sales figures. Despite these improvements, the fact that Tesco has launched Jack’s suggests that it is still concerned about the ongoing threat from the German discounters. With uncertainty around how food prices may fluctuate in the months ahead, it may well turn out to be a shrewd move. Of course, there is also the proposed merger between Sainsbury’s in Asda to consider. However, in terms of brand positioning there is an obvious challenge. Aldi and Lidl have cemented their appeal, and the public clearly understand what the brands stand for. Crucially, this applies to all cross-sections of society. Aldi and Lidl have been able to attract middle class shoppers that have been impressed by the quality of their offering. With all this in mind, breaking into this market is no easy task.